There are many stories about the person with the 9-to-5 job who quits to follow her dream. Heck, you’ve read them on this site about a Whole Foods chef and gelateria owner. But the stories you don’t hear are the ones where the business people didn’t succeed in the way they’d hoped. And that’s where lifelong Alexandrian Jody Manor, owner of Bittersweet Catering & Café, comes in. Three former Capitol Hill staffers rented space at 103 North Alfred Street in Old Town Alexandria, Virginia, to start a food business, mainly filling take-out orders. “They were pioneers in the neighborhood,” Manor explained. King Street Metro opened the same year as Bittersweet, but they took a chance with the location given it was half a mile from Metro one way and half a mile from the busy, scenic waterfront in the other direction. In 1985, Manor began a freelance catering gig at Bittersweet before landing a permanent $5-an-hour kitchen job. Eventually, he acquired the company from the women who started it and now guides the company as its sole owner. “My job is to see where we’re going to go,” he said. A self-described “cook’s cook,” Manor has more than 25 years of Bittersweet history behind him to help run the “different universes” that make up the business: the bakery, catering kitchen, café and office. Having worked in the restaurant business since he was 14, Manor figured out over the years how to successfully fulfill corporate catering orders, get consistent crowds in the café – it’s a combination of a “fair amount of tourist business and regulars” – and innovate while maintaining the core values and products people expect. “Our big strength here is our super-loyal customer base and super-loyal employees,” he said. 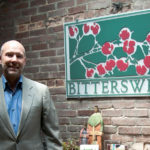 Bittersweet’s longest-serving employee is Angel Brizuela, a Honduran immigrant who has been with the company for 22 years. “He was a skinny, shivering kid who came to the back door. He didn’t speak English.” Over the years, it became evident that Brizuela is precise, quiet and highly focused, a great recipe for a master baker. He eventually earned that title and now heads all baking operations. Manor was emotional when we discussed his colleague and friend of more than two decades. “It’s great to come to work and see the American dream [in Angel] every day. When he started there were six employees. Now there are 40.” How did Manor grow his team? “Treat the staff well. That’s totally, 100 percent what it’s about,” he said, emphatically. “Focus on what you’re good at” and hire people who excel in the areas that aren’t your strong suit. As an aside, Dear Reader, I have to wonder: Is this the secret to success in any business? Employee retention is just one element. Obviously, the quality of he food is what keeps customers coming back. “All our stuff is from scratch and made every day. We must produce and execute well every day. That generates catering business and a good model.” The recipes are an amalgam of Bittersweet cooks past and present. 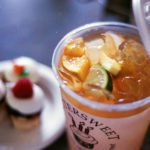 Times were especially good for Bittersweet in 2007, which Manor pointed to as a big growth year. It was also an investment year with the acquisition of an adjacent building, which houses offices and the new catering kitchen. Catering provides 60 percent of incoming business and the café makes up the remaining 40 percent. The storefront is now a “very efficient machine. You buy product, cross your fingers and hope to sell out. Most of our products do sell out. Our history in the business plays a role, plus throwing food away is a major sin,” Manor said. To that end, Bittersweet occasionally has end-of-day or day-old sales on bakery items. 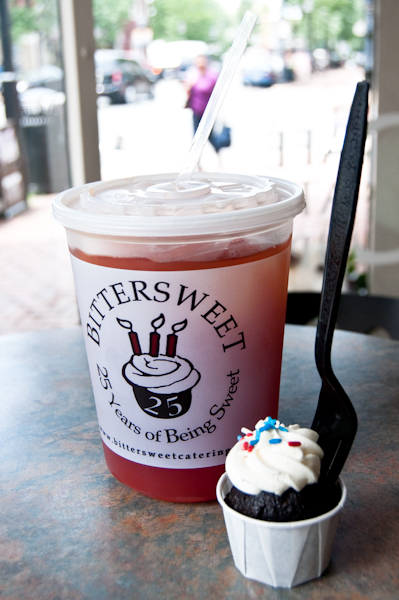 At the bustling Old Town waterfront, Bittersweet recently opened The Snack Shak in the Torpedo Factory Food Pavilion. Its healthy menu items are great for locals out on a lunch break looking for something healthy as well as tourists trying to find something lighter on the wallet and lighter in calories. 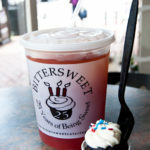 All the ingredients at Bittersweet are the “real deal,” Manor noted. “We do big business in salads and move a lot of gazpacho, which is like eating V8 [vegetable juice].” And they don’t do diet cupcakes. Speaking of cupcakes, Every Food Fits reader, @lisatella on Twitter, said she made some cupcakes that turned out dry. It was a great opportunity to ask Bittersweet’s master baker, Brizuela, for secrets to the perfect cupcake. He said to use a recipe that calls for cake flour and vegetable oil. Also, baking requires consistent temperature and humidity, and if those conditions change, so will the recipe. Finally, if you’re using a gas oven, check with the gas company to see if they offer free calibration services. Above all – consistency!